Lightning is a natural phenomenon that often accompanies rain and storm. Usually, lightning isn’t hazardous. But, during extreme weather conditions, it can prove to be life threatening. Especially, if you need to be outdoors when the storm is imminent. It is always better to be safe than sorry. We cannot prevent lightning from striking, but we can always keep ourselves at a safe distance from it with the help of light detectors. But, there are plenty of such detectors out there. So, which one must you buy? In this article we learn more about the lightning detectors so that you can make the right choice. Keep reading! The first question you must ask is: What do you need the lightning detector for? There are two types of detectors available in the market – Personal and Professional. Which one should you pick depends largely on your needs. A quick overview of both these types will help you make the right choice. As the name suggests, these types of lighting detectors are meant for personal use. They are perfect for golfers, campers, or others who need to be outdoors. These devices are quite portable and usually much smaller than your mobile phones. They can be easily carried around in your pocket. This type of detector catches the electromagnetic pulses generated by the lightning. Based on the strength of the signal, the detector tells you the distance of the lightning strike. Personal lightning detectors are very limited in their capabilities. Hence, they are cheaper too in comparison to professional ones. These devices cannot tell you the direction of the lightning and whether it is approaching your location or not. They also cannot tell the actual location. Personal detectors may not always be accurate as they may catch EMP signals from other devices or machines such as electrical appliances, cars etc. Professional-grade lighting detectors are more advanced technologically and hence offer enhanced performance. 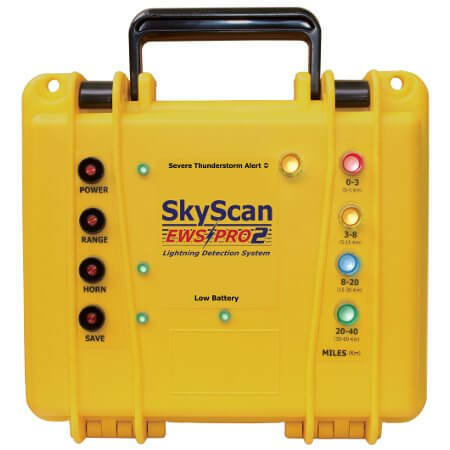 Professional lightning detectors are also usually portable and offer mobility. However, they pack more improved functions, thereby providing more accurate results. Unlike the personal detectors, they can tell you the direction and location of the lightning. They also do not catch false signals and hence do not provide the false readings. They also offer storm tracking, intra-cloud lightning detection and many more additional features. Since professional detectors offer more advanced features and additional capabilities, they can be really expensive, especially when you compare them with the standard ones. These types of detectors are designed to measure the amount of energy released by the lightning. RF detectors can give you the rough estimate of the direction of the lightning and its distance. This technology is primarily used in the high-end, complex lighting detectors. This is why Interferometer lightning detectors may require special skills, knowledge and certain amount of experience to operate. These detectors are often used as multi-station devices and are capable of providing more accurate lightning data. These detectors are thus often used by the researchers. These types of detectors are used for forewarning of lightning. They detect the changes in the voltage in the earth’s electric field and based on that predict the lightning strike. Electric Field Mills lightning detectors can be very accurate. However, they have a very small range of up to 8 km. As the name suggests, these devices use the optical technology to detect lightning. They are used as the pre-lightning monitors or detectors. They can detect inter-cloud lightning and warn about cloud to ground lightning which happens afterwards. A single-technology lightning detector may not be good enough to get the accurate results. This is where hybrid devices come into picture. They make use of multiple lightning detector technologies and offer more accuracy and reliability. Hybrid detectors can be both professional as well as scientific. But, they are also more expensive than the regular ones. Range is another extremely important factor to take into account while shopping for a lightning detector. Most personal detectors are incapable of providing the distance and direction of the lightning and they have a very small range of operation. That’s why it is almost impossible to know whether or not and when the lightning will strike your location. If you reside in the area which is regularly hit by storm, you would like to have a lightning detector that not only tells you the distance but also has a large range. In a storm prone region, one must have a detector with a range of at least 20 miles (more is better). This will give you ample amount of time to take appropriate safety measures. Another advantage of high range detectors is that they help you determine whether the storm is headed your your not. If the distance has decreased over time, it means the storm is moving towards you. On the other hand, if the distance is increasing, you can be relaxed as the storm is moving away from you. What good is the lightning detector if it cannot alert you of the approaching storm? The lightning detectors should have the alarm system that quickly catches your attention, whether by the way of audio or visuals (or both). This is all the more important if you live in the region where weather is capricious and storms unpredictable. It is best to buy the detector with LED indicator as well as loud audio alarm. Price is definitely an extremely important aspect to keep in mind. So, before you go out shopping, determine your budget and decide how much you are really willing to spend. Lightning detectors can be as cheap as $$ and expensive as $$,$$$. Pick the best that is there in your budget. Buying a lightning detector could be a little tricky. After all, there are so many types, technologies, and prices to choose from. It is all the more confusing when you are a first-time buyer. Ultimately, it all boils down to your needs and budget. Identify your needs and determine your budget. It will help you make the choice. I hope you liked reading this article as much as I did writing it.